Just 6 miles from Nottingham city centre, The Nottinghamshire Golf and Country Club offers an exclusive high-end golf experience, with two 18 hole courses set in 340 acres of parkland and an exclusive Lakeview Restaurant and Clubhouse Bar. A new owner and a recent programme of extensive improvements prompted them to get in touch with us with a view to rebrand as an exclusive leisure, spa and conferencing complex for discerning golfers, corporate entertainment organisers and couples wanting to get married in this luxurious and picturesque setting. 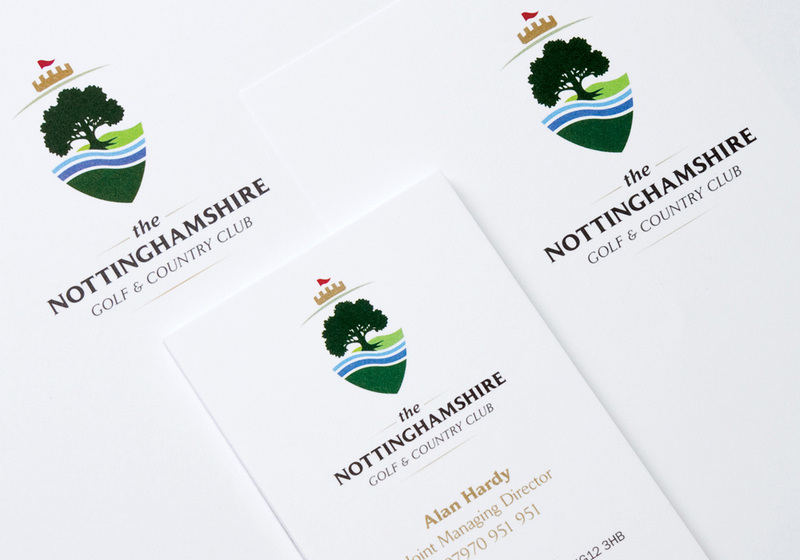 Central to a unique brand identity, we created a marque that was inspired by the heritage and landmarks of the area, the natural features of the county and the course in a contemporary take on the traditional coat of arms. A family of linked, individual identities were developed for each of the courses, the conferencing, spa and wedding facilities, allowing each to be marketed individually to their separate audiences. Rolling the identity out across stationery, banners, signage, score cards, course planners, promotional merchandise and a website.